The term endbrain refers to one of two components of the forebrain. 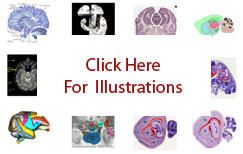 As the more rostral component, its most prominent cellular subdivisions are the cerebral cortex, the basal ganglia, the septum, and the basal forebrain. The more caudal component of the forebrain is the interbrain ( Carpenter-1983 ). The endbrain is grossly equivalent to the cerebrum of the Functional CNS Model - Rat of brain structure ( Swanson-2004 ). It is found in the human, macaque, rat, and mouse.